The Bay Area Ridge Trail has expanded above Alum Rock Park in the Sierra Vista Open Space Preserve. Google Maps image. If you read the San Jose Mercury News, you know that the Bay Area Ridge Trail celebrated another addition to the ambitious trail network ringing the bay area. 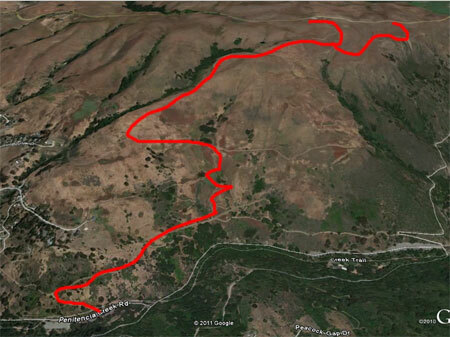 It’s located in Sierra Vista Open Space Preserve, next to Alum Rock Park, extending to Sierra Road. There’s also a new segment to the south that climbs to a vista point. I ride in Alum Rock Park a fair amount, and I’ve ridden up and down Sierra Road a half-dozen times. This new trail is going to be a challenge, even for experienced riders. There’s no easy way to make it up the ridge overlooking Alum Rock Park. I’ll probably try it out by riding/walking up Boccardo Trail one of these days. I’m not sure I’d want to ride down it. This entry was posted on October 22, 2011 at 9:04 pm and is filed under News. You can follow any responses to this entry through the RSS 2.0 feed. You can leave a response, or trackback from your own site.